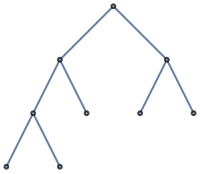 generates a tree plot of the graph g.
generates a tree plot of the graph with edges ej. plots ei with features defined by the symbolic wrapper w.
uses rules vi 1vj 1 to specify the graph g.
generates a tree plot of the graph represented by the adjacency matrix m.
places roots of trees in the plot at position pos. 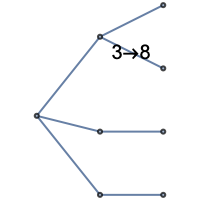 uses vertex v as the root vertex in the tree plot. 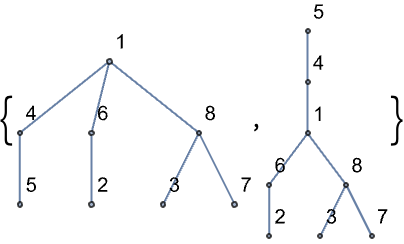 TreePlot attempts to place vertices in a tree of successive layers, or a collection of trees. 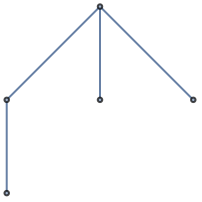 TreePlot supports the same vertices and edges as Graph. 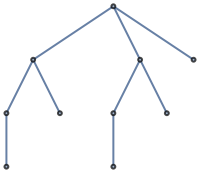 If the graph g is not a tree, TreePlot lays out its vertices on the basis of a spanning tree of each connected component of the graph. TreePlot[g] attempts to choose the root so as to make trees have as few layers as possible. TreePlot[g,pos] places the roots at position pos. Possible positions are: Top, Bottom, Left, Right, Center. By default, TreePlot places each tree root at the top.